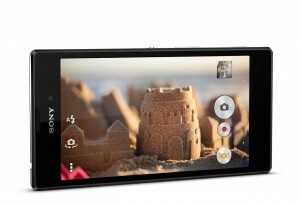 Sony has just introduced its new model for mid-range smartphones. The Xperia T3 is a 5.3-inch phone, extra slim, and very carefully designed, finished with a metal frame that gives it a special resilience. It is designed to reach a broad audience, taking advantage to the current fashion for large devices while maintaining tight specifications that will likely be translated into a more affordable smartphone than other devices with a comparable size. The HD TRILUMINOS 5.3-inch screen has a resolution of 1280×720 pixels with Mobile BRAVIA Engine 2 technology, which applies a filter to highlight the image details. The colors look very natural, and the noise is actively minimized, but the total pixel density does not pass 227 ppi, something quite low when compared to other devices in the market. The processor is a Snapdragon 1.4 GHz, with 1 GB of RAM and 8 GB of internal memory expandable via SD up to 32 GB. It has a 8 MP rear camera with Exmor RS sensor, capable of taking good pictures even in low light conditions, and a 1.1 MP front one. It also includes HDR (High Dynamic Range) for more natural colors in both image and video. Its technology is especially useful when you want to capture images in which there are very bright areas and others with very low illumination. The differences are smoothed and can you can see a smooth gradation of intensities. Sony has also included other photo characteristics typical of the company, such as SteadyShot, which offers greater stability even when recording movies in Full HD 1080, or Timesift burst, which lets you take 31 frames in 2 seconds. 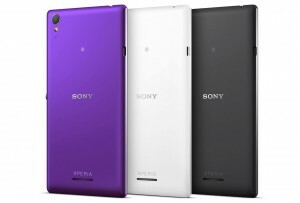 The Xperia T3 has the typical apps for Sony image processing preinstalled, such as Portrait retouch, AR effect or Social Live. In addition, we can easily access to many other retouching apps that can be download directly from the viewfinder of the camera. The Xperia T3 carries a 2600 mAh battery with the power saving mode STAMINA. When this option is enabled, the phone automatically turns off the functions that run in the background, thus considerably extending the battery life. However, the most attractive point is its thickness. 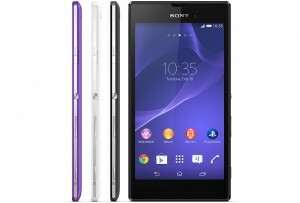 The Xperia T3 is an incredibly thin smartphone, it is only 7 mm thick and weights 148 grams. It will be available in three colors, white, black and purple. The price is not known yet, but its global launch is scheduled by the end of July. More information at Blogs.SonyMobile and SonyMobile.